In an effort to cash in on the modern popularity of the Far Cry franchise, Ubisoft has decided to recreate the original entry for the Xbox Live Arcade. Where do you go from Far Cry 3: Blood Dragon? Apparently Ubisoft's answer is "back to the beginning." Far Cry Classic is, as its name suggests, a remake of the original Far Cry scheduled for release on the Xbox Live Arcade at some point this summer. 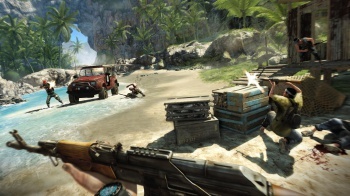 Little is known of the game, but Ubisoft describes it as the "ultimate" version of Far Cry released to date. The title will set you back $7 whenever it comes available. As the original version of Far Cry made its PC debut way back in 2004, it's helpful to remember that the game isn't really that similar to its successors. Far Cry relied on its massive vistas and gorgeous (for the time) graphics to woo players, but elements like spreading fires and wildlife weren't introduced to the series until Far Cry 2. By comparison, Far Cry plays like a particularly engrossing shooter of its era instead of the open-world survivalist fantasies its sequels would become. Still, it's a very solid shooter (as long as you ignore the nosedive the story takes toward the latter half of the game), and depending on what enhancements the Xbox Live Arcade incarnation sees, that $7 price tag could be very enticing. We'll bring you more as it emerges.